A high-speed railway line between Leeds and Manchester - dubbed HS3 - has been fully endorsed by Prime Minister David Cameron, having first been mooted earlier in the year by Chancellor of the Exchequer George Osborne (RAIL 753). 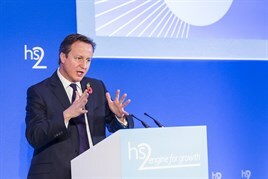 Osborne, as well as Secretary of State for Transport Patrick McLoughlin, joined Cameron at the launch of HS2 Ltd Chairman Sir David Higgins’ second major report into progress on high-speed rail development, nominally HS2. The report lays the foundations for a national transport strategy, with specific benefits to the north of England. Higgins suggests that HS3 - as it has rapidly become known - would be as important to the North as Crossrail is to London, although it would be only one step in improving transport as a whole between Liverpool and Hull. “Improving connectivity is vital,” said Higgins in a speech at Leeds Civic Hall on October 27. “Knowledge-based companies, whether they are in high-tech manufacturing, the creative industries, finance or the law, have to be close (or feel close) to the talent, skills base, support network, knowledge pools, collaborators and clients necessary to create the ‘hot-house atmosphere’ in which they thrive. Journey times by rail between Leeds-Birmingham, Leeds-Sheffield Meadowhall, York-Birmingham and Nottingham-Birmingham could be halved, or potentially by even more. Many other journeys across the country could also be shortened. Higgins reinforced the need to take forward both legs of the proposed ‘Y’ network, as the alternatives would not bring the same capacity, connectivity and economic benefits. But he also proposed that the local authorities from the five key cities should speak with one voice on transport matters as ‘Transport for the North’. He said a timetable would need to be set out to develop the new transport strategy, based on the One North proposals and existing HS2 plans to improve both rail and road transport links north of Birmingham. Speaking after Higgins, Cameron said the Government was “looking at the potential for HS3, effectively giving that the future green light”, and that the launch of Higgins’ second report was a “massive reaffirmation of HS2”. Acknowledging overcrowding and a lack of capacity across the rail network, Cameron continued: “David Higgins is right when he says that we underdid the importance of capacity and connectivity. They are so vital in terms of justifying this project.” But journey times were still important, he pointed out. Adding that “the Y-shaped design is the right approach, and I think it’s important we reaffirm that today”, Cameron praised the “really exciting” vision of high-speed rail. “I think the real vision is about rebalancing our economy overall,” he said. “And that’s why I think the combination of HS2 and HS3 is so powerful, because the truth is this: we do have extraordinary successful Northern cities in our country. Osborne said it wasn’t just high-speed rail that is “absolutely central to this vision”, but also some of the local transport connections and urban transport systems. Osborne recognised that the strategic transport plan that includes HS2 and HS3 was not going to work “in Whitehall, 200 miles or so away”. He vowed there would be “strong local involvement in determining these plans” and said that bringing together the northern transport authorities - covering rail, roads and other forms of public transport - would “play a major role in developing high-speed rail”.